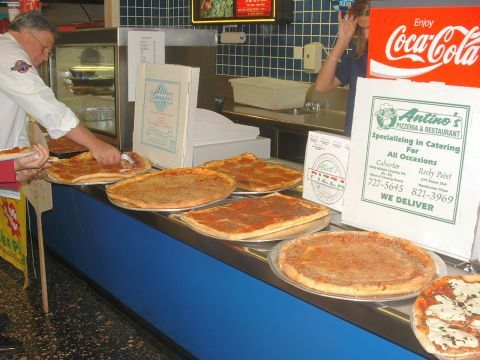 Competitors perform their best in order to earn the title of "Best Pizza on Long Island." LongIsland.com coordinates this contest whose decisions regarding the selection of winners and all other aspects of the contest shall be final and binding in all respects. LongIsland.com will not be responsible for typographical, printing or other inadvertent errors in these Official Rules or in other materials relating to the contest. If you have any questions regarding this contest, please contact LongIsland.com at 278 Indian Head Road in Kings Park (11754), and by phone at 631-406-4410. For Voters: There is absolutely no fee to participate in the Best Pizza on LI online voting. You can vote for your favorite pizzeria(s) from now until the end of September. In the interest of a fair contest, the system is set up to register only one vote per day, per pizza category and per computer. This means you can vote as often as you like, but only once per day. Finalists will be selected from the top five pizzerias in each category participating in our contest. Those pizzerias will be asked to join us for a final judging at the Best Pizza on LI Pizza Bake-off which will be held in October. If a pizzeria declines our invitation to participate, the next pizzeria on the list will be asked to participate until five (5) finalists are picked in each pizza category. Sponsor reserves the right to disqualify persons found tampering with or otherwise abusing any aspect of this Contest as solely determined by Sponsor. In the event the Contest is compromised by a virus, non-authorized human intervention tampering or other causes beyond the reasonable control of Sponsor which corrupts or impairs the administration, security, fairness or proper operation of the Contest, Sponsor reserves the right in its sole discretion to suspend, modify or terminate the Contest. This is a charitable event: LongIsland.com puts together this friendly competition each year to support local pizzerias and to raise money to help feed the hungry on Long Island, New York. A portion of the proceeds is donated to Long Island Cares and Island Harvest, non-profit organizations dedicated to feeding the hungry on Long Island. Please visit our Sponsor information page to find out how you can become a sponsor, or make a donation. For Pizzeria Entrants: Limitations of Liability: By entering the Contest, entrant agrees that (1) any and all disputes, claims, and causes of action arising out of or in connection with the Contest, or any prizes awarded, shall be resolved individually without resort to any form of class action, and entrant waives his or her right to a jury trial for such disputes, claims, and causes of action; (2) under no circumstances will any entrant be permitted to obtain an award for damages. Entrant hereby waives all rights to claim punitive, incidental or consequential damages as a result of participation in the contest, festival or bake-off. All rights to have damages multiplied or otherwise increased and any other damages of and relating to this competition are waived by the entrant upon acceptance of these terms and official contest entry and participation. There is a $20 entry fee/donation per pizzeria location to participate in the pizza contest. Be sure to include your pizzeria name, address, phone and email (if available). Your pizzeria must be operated in Nassau or Suffolk County New York. Chain or multiple locations will be voted on as individual shops by location. Once registered, your pizza voting page will display an icon indicating that your pizzeria is officially entered in our contest. Once registered your pizzeria will receive flyers which, are distributed by Cremosa Foods, one of our sponsors. Hand out these flyers and tell your customers to VOTE for YOU! Computerized Voting System: We have set up a simple voting system on the Web site at LongIsland.com that will collect and tally the votes. At the end of September we will select the top five pizzerias from each category. Categories include BEST Regular, Sicilian, Marinara, Grandma and Specialty Pizza. The top pizzerias will be invited to join us for the pizza bake-off and final judging at the annual Best Pizza on Long Island Festival & Bake-Off held in October. Pizzeria finalist will be notified with full details and instruction for the final competition. Best Pizza on Long Island Festival & Bake-Off: Pizza will be prepared and baked on premises with pizza related activites schedules throughout the day. This event is free and open to the public, please see Long Island's BIGGEST Pizza Party for full details of the Long Island Pizza Festival & Bake-Off. Pizza ovens and refrigeration for storing supplies will be provided for the participating pizzerias. For Finalists: Pizzerias may only participate as contestants, not as sponsors of the contest or as judges. Pizzerias may advertise on our Web site, are encouraged to promote the contest to their customers and may provide links to the contest if they have their own Web site. Optional advertising to promote public awareness of their participation in the competition is permitted. Promotion to local media outlets, print ads, advertising as well as word of mouth are acceptable. All costs associated with advertising above and beyond the official flyers provided by LongIsland.com are the sole responsibility of the participating pizzeria. Any and all advertisements must make mention of LongIsland.com as the sponsor of the contest and provide an active hyperlink and/or text link referencing the LongIsland.com Web Site. LongIsland.com absolutely does NOT condone, endorse or promote the sending of unsolicited emails (SPAM) for the purpose of collecting votes for this competition. By entering the contest, entrant agrees to be bound by these official Rules and the final decisions of the judges. Pizzerias selected for the final judging must commit to partipate in the Pizza Festival on that day. Pizzerias selected will need to provide a product liability endorsement with L.I. Adventureland and LongIsland.com named on the policy. In addition, pizzerias will need to provide their own ingredients and a qualified individual to make the pizza that will be used for the final judging. Agreement to participate in the bake-off constitutes agreement to accept the decisions of the judges, for the purpose of this contest. Winning pizzerias will receive recognition and awards. Participants agree that photos taken at the event and of the winners may be reproduced and reprinted on the Web site, in various news publications and/or advertising materials. LongIsland.com reserves the right to amend/update these Official Rules from time to time. Changes will be posted here. Please check this area regularly for changes to this policy. Your continued participation in the LongIsland.com Best Pizza on Long Island contest indicates your acceptance and compliance with the Official Rules. If you do not agreed with our Official Rules or for any reason you and wish to withdraw from the promotion, please contact us via email with your request.